Describe the impact of onboarding sales reps on your company’s reps and managers. Gather details about the sales process from experts at your company. Create a functional sales path for your sales reps.
Onboarding sales reps quickly can be a challenge, because every company has its own sales process. Take, for example, the emerging solar energy systems provider Ursa Major Solar. They have a few sales reps who can sell like the dickens. But the company is growing, and as great as they are, the existing sales team needs help. So they hired two new reps, Erin and Lance, who have decent selling experience already. Even though Erin and Lance know how to sell well, they’re not familiar with sales processes at Ursa Major. That’s where Maria, the Salesforce admin, comes in. Maria learned that Salesforce includes a feature that helps reps adopt her company’s sales processes. It’s called Sales Path, and it’s available for working leads and opportunities. When Maria sets up Path for her teams, she guides sales reps so they sell the way Ursa Major sales managers want. Maria’s work helps the company’s sales reps qualify their leads and close their deals—from anywhere and with fewer delays. Sales reps Reps learn the steps necessary to keep the sales process moving along. And reps can eliminate any steps that aren’t a part of the sales processes at their company. The reps at Ursa Major like Path because it helps them focus on what matters most to qualify leads and win deals. Sales managers Managers keep their reps aligned with the sales processes unique to their company. Sales paths help managers identify star performers and the ones who need a bit more guidance. For now, Maria wants to focus on paths for leads. She maintains two record types for them: one for solar energy systems sales and one for service plans. In Maria’s situation, she can serve her sales teams best with two paths. That’s because qualifying leads for solar energy system sales is different from qualifying leads for the plans to service the solar energy systems. But that’s fine! Maria can tailor each path so her sales reps can make the most of their leads. Maria has lots on her plate. In addition to administering sales features, she administers service and collaboration features in Salesforce. So she’s the first to admit that she doesn’t know everything about her company’s sales processes. To work smart, she pulls in the experts—sales management. She knows the sales manager, Lincoln, who’s down the hall. On a Friday afternoon, Maria tracks down Lincoln, just as he’s about to stream some smooth jazz. Maria tells him about Path and how it can help his sales team adopt their sales process and close more deals. Lincoln’s eager to help. Maria asks Lincoln about specific details that he requires for his sales reps to cover as they work through each step of the sales process. The timing for this conversation is ideal, because Lincoln wants to freshen up their sales processes in Salesforce anyway. He tells Maria about five steps in their sales processes. The two sales processes for Ursa Major share most of those steps. We mentioned earlier that Maria plans to create two paths: one for solar energy systems sales and one for service plans. As Lincoln explains the differences between the two processes, Maria takes notes on the steps for the two paths she plans to create. We put her notes here into a neat table. Respond to lead within 5 minutes. To learn about your lead’s business, visit their website. Ask about the performance of your lead’s solar system. Get your lead’s latest email address. Learn about your lead’s industry and their energy consumption. Investigate your lead’s service needs (phone, email, or on-site). What’s their annual budget for service? Review service plans with your lead. After you mark this lead Qualified, follow prompts to convert the lead to a contact. And don’t forget to create an opportunity when prompted. Schedule an on-site visit with your lead to review service plans in depth. Ask whether your lead needs anything else from us. If your lead doesn’t have the interest or the authority to purchase a solar energy system, mark the lead Unqualified. Don’t waste time on unqualified leads. Learn about the lead source before you spend time selling them a product they're not ready for. Understand your lead's level of authority and solution requirements. Determine whether your lead is likely to buy from you. If your lead doesn’t have the interest or the authority to purchase a solar energy service plan, mark the lead Unqualified. Without Lincoln’s input about their sales processes, Maria would’ve missed important details—details that guide sales reps toward greater success with working leads and closing deals. The two of them together, though, make for a great partnership. Lincoln’s the one with the sales expertise, and Maria’s the one who can implement Path. 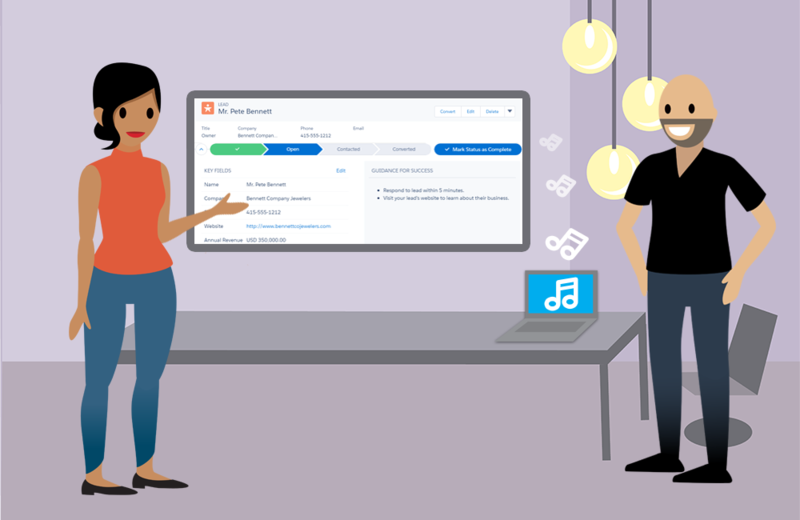 After you explain to your sales operations manager how Path enforces your company’s sales processes, get guidance from that manager about your company’s unique processes. 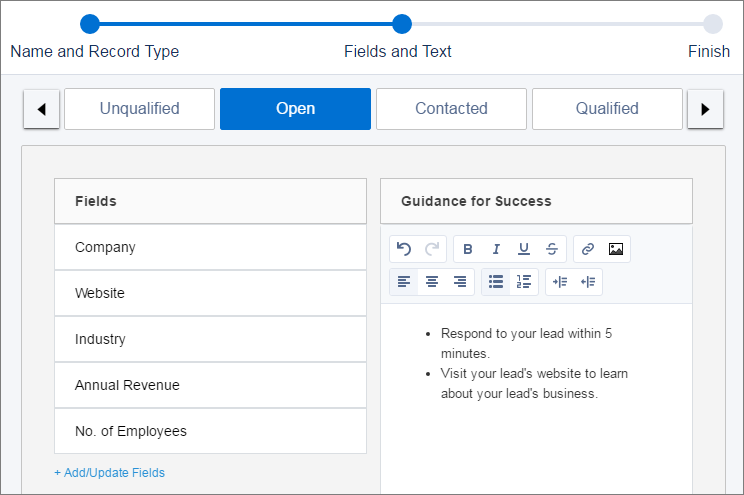 With your sales operations manager, determine and customize the stages that appear for your reps. Add fields that are relevant to your company’s sales processes, and include guidance for success. In your guidance, you include details about company policies, tips for establishing positive selling relationships, and links to relevant feeds. Maria set up one of the paths that she and Lincoln planned. And now those new sales reps, Erin and Lance, see a visual representation of the stages necessary to qualify their leads. Using the lead workspace, Erin and Lance see their path front and center. The path appears with the stages and guidance you and your sales operations manager provided. Reps mark each stage complete when they’re ready to move on to the next. The beauty is that reps focus on only the fields that matter most to your sales managers. That way, reps stay focused on what matters most to qualify leads and win deals. Let’s review how Maria set up a path for leads. Let’s look at how Maria set up one of her paths for leads. 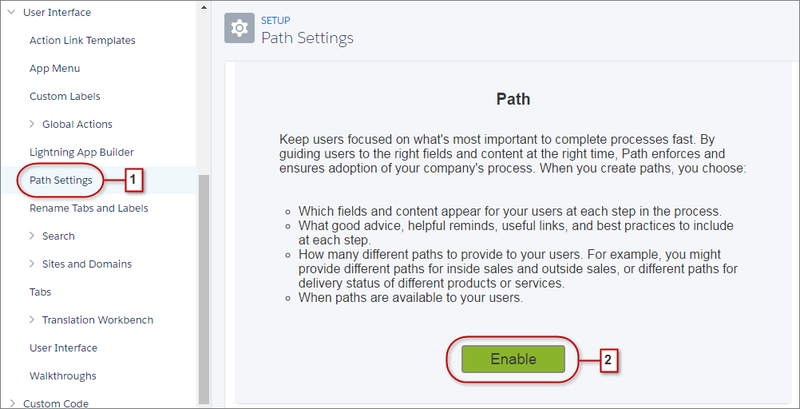 From Salesforce Setup, Maria enters Path in the Quick Find box, then selects Path Settings. Maria then creates a path. In the Path Name field, Maria enters the name of the path. This one’s for solar energy system sales. It’s good that she thought of a name that makes sense to her, because she’s the one managing paths. When Maria tabs to the next field, API Reference Name populates automatically, and includes underscores instead of spaces. She just skips over that field. For Object, Maria selects Lead. For Record Type, she selects the one specific to her solar energy system sales. Then she clicks Next. For each stage, Maria adds the key fields unique to that stage. Then, she adds guidance for success. Remember the notes that Maria took during her meeting with Lincoln? Here’s where Maria includes best practices, tips for effective communication, and whatnot. After she’s done with all the stages, Maria clicks Next, then selects Save and Publish Later. That way, Maria can go back to the path and refine it so that it’s tight. Use these resources to learn more about Path.